LONDON--(BUSINESS WIRE)--Technavio analysts forecast the global advanced biofuel market to grow to USD 44.6 billion by 2021, at a CAGR of close 44% over the forecast period, according to their latest report. 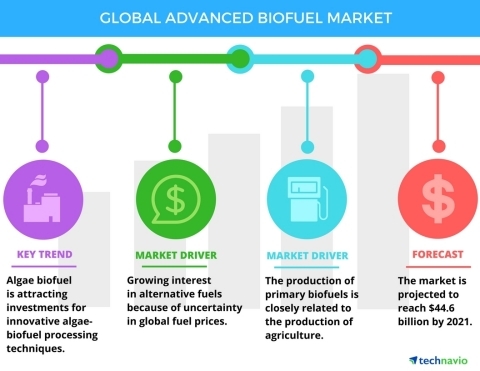 The research study by Technavio on the global advanced biofuel market for 2017-2021 provides detailed industry analysis based on the fuel type (cellulosic ethanol, biodiesel, and BioDME) and geography (the Americas, EMEA, and APAC). Advanced biofuels are produced by using non-food, organic, industrial, and municipal solid waste as feedstock. Cellulosic ethanol is the most popular advanced biofuel, generating about 40% of the overall revenue. Cellulosic ethanol is produced using agricultural wastes through enzyme or acid hydrolysis, and is popularly used as an automotive fuel. Increased R&D efforts are gradually paving way the way for the large-scale commercialization of advanced biofuels. Biofuel blends are being used in regular vehicles with little or no modification to engines, which is encouraging the use of blended fuels in vehicles. Some countries have set regional targets regarding the use of biofuels as a pure mix or as blends. In countries such as Germany and India, governments are directing the use of biodiesel and bioethanol in their public transport systems. The Renewable Energy Directive (RED) established by the European Union (EU) aims at having 10% of the transportation system use renewable energy by 2020. Become a Technavio Insights member and access all three of these reports for a fraction of their original cost. As a Technavio Insights member, you will have immediate access to new reports as they’re published in addition to all 6,000+ existing reports covering segments like industrial gases, olefins, and metals and minerals. This subscription nets you thousands in savings, while staying connected to Technavio’s constant transforming research library, helping you make informed business decisions more efficiently. Technavio has announced the release of their Global Advanced Biofuel Market 2017-2021 report.